So much to see under the sea! Since Costa Rica is held on two sides by equatorial oceans, it's no surprise the country has some very nice diving! No matter your speed—leisurely snorkeling, air-holding skin diving, an introduction to SCUBA or experienced certification level dives—you will find plenty of opportunities to get up close with Costa Rica's amazing marine life. On your non-diving days, you can take guided boat trips or go sea kayaking to observe more magnificent ocean fauna—think dolphins, whales and sea turtles—from the surface. Get in gear. Beach hotels often rent snorkeling equipment (mask, snorkel & fins) and can direct you to the best local rocks and reefs where sea life may be spotted. Many operators run dive boats that take enthusiasts for day (and sometimes night) trips further off the coast. There are even some live-aboard options. Costa Rica's Pacific waters offer divers varied and plentiful marine life. Current calculations show a total of 4,745 marine species in Costa Rica's Pacific waters, more than double the number reported from the Caribbean side of the country. Schools of small fish (often by the thousands), colorful tropical fish, jacks, barracudas, eels, sea turtles, Eagle rays, White-tip reef sharks, Manta rays and Bull sharks are commonly spotted. Diving is great any month of the year. This is primarily due to the abundance of plankton and other marine organisms at the lower end of the food chain that thrive in the warm 75 to 85 degree tropical waters. Average visibility ranges from 30' to 50' with possibilities of up to 80'. Beginners can practice in the pool. For the beginner, check out Playa Hermosa. There you can take classes in the swimming pool with a certified master diver, followed by a couple open water dives. Pool instruction takes a couple hours and covers basic safety and comfort skills before going into the ocean. If you are staying in the Central Pacific region of Costa Rica, go from the beach in Manuel Antonio or Jaco. Island life is for fishes too. The Pacific side of Central America has dozens of little islands off the coast where fishes aggregate and divers have the chance to see more pelagic (open ocean) species. If you are staying on the Nicoya Peninsula, there is an incredible array of marine life of all varieties and colors awaiting you off of the nearby reefs and islands. Check out the Catalinas or the Murcielagos, two popular (although sometimes challenging) Costa Rican dive sites. Caño Island is an excellent underwater destination fairly close to the mainland in the South Pacific region. It is said to have some of the best snorkeling and diving in all of Costa Rica. 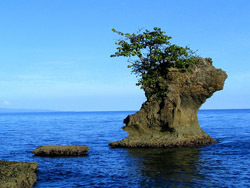 Boat trips to Caño Island depart Drake Bay off the stunning Osa Peninsula. However, the pinnacle site for true dive aficionados is Isla del Cocos or Cocos Island. This PADI-rated Top Ten Scuba Diving Spot is within Coco Island National Marine Park about 500 km off the South Pacific coast. It is more similar in some ways to the Galapagos Islands than other marine areas of Costa Rica. Here, live-aboard divers share pristine water with some very large pelagic sea life! Imagine yourself amidst an enormous swirling school of hammerhead sharks or sidling up to a 40-foot whale shark! The Pacific Ocean demands respect. Strong ocean currents mark the western coastal waters of Costa Rica. These powerful, often invisible currents can quickly threaten swimmers outside suggested swim zones. Best to dive or snorkel with a good local guide that knows the area and can keep you safe—that way you can just relax and enjoy the fantastic underwater scenery. Caribbean coral reefs draw visitors to Costa Rica's warm teal waters. Spend a day, a week, a month… it still won't be enough time to soak in the wonder of these fantastic tropical waters. Scuba operators may not be as easy to find on this side of the country, but that doesn't mean the diving is not good. All along the Caribbean coast there are many small reef areas, but Isla Uvita off the coast of Limon has a shipwreck named Fenix provides divers with many colorful sights. Sea turtles, moray eels, colorful fish in villages of coral. Off the shore of Cahuita National Park you will find a large reef system, home to more than 30 species of coral, including elk-horn coral and hundreds of species. There are also accessible shipwreck dives fairly close to shore. The best diving in Costa Rica's Cahuita reefs is said to be near the southern section of the area, closer to Gandoca-Manzanillo Wildlife Refuge, where there has been less damage to the coral from human activity. Corals are animals that deserve our regard. Most of us know that corals are critical structures that support much of the world's sea life. These delicate animals can be easily broken and killed by careless fins and greedy hands. Only conscientious divers and snorkelers can ensure these underwater treasures are preserved.